The Seattle YMCA Association is one of the better YMCA associations we have had the pleasure of working with. From Coal Creek to Sammamish Family to Dale Turner to finally Auburn Valley, we have seen some great Ys with some great people. Associations like this show what really is possible with a coordinated and cooperative group of health clubs, which is impressive based on the variety of equipment and activities available. 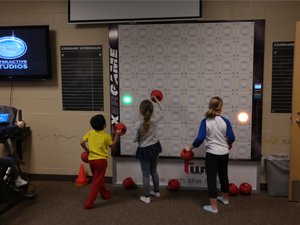 Auburn Valley YMCA has gone down the same route as many other YMCAs and has gotten a single T-Wall 64 Interactive Wall. The strategy and idea behind this is that they will slowly add exergaming products to the room until they have an ExerZone like the Rye YMCA ExerZone. The T-Wall can keep a whole room of people active with the correct Active Floor Markings and accessories like kettlebells and Hyperwear sandbells. The most important part is to keep people engaged and active, to make their time in the space as efficient as possible. Some may view this as slow progress only selling one piece of equipment to one health club location, but it is all going according to our plans on having a T-Wall in every health club in America. Taking the first step into interactive fitness and getting a taste of how efficient the machines can be, will only make them want exergaming pieces more and more. We are confident that Auburn Valley will be very happy with their T-Wall and accessories, hopefully this will assist in some small group training or after school youth fitness programs. As always stay tuned for all your Exergaming news! @ExergameFitness —-> Facebook. Twitter. YouTube. Google +. Instagram.